True story: A slow cooker is a busy homeschooling momma's best friend. Like in the famed children's classic stone soup, you can pretty much toss a whole bunch of your-entire-pantry into a slow cooker, turn it on low, and serve up a delicious meal by dinner time. What other best friend can claim those kind of props, I ask ya'?! This recipe is clean...as in squeaky...no MSG, no fake food, no can't-pronounce ingredients...nothing but whole food goodness-making my cooker and me good pals once again. 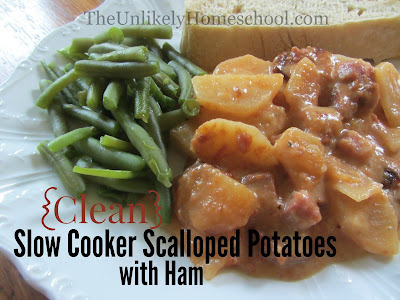 In a large slow cooker, combine 6 sliced russet potatoes and 1/2 pound of cubed ham. Sprinkle with 1/2 T. minced onions and set aside. In a saute´ pan, melt 4 T. of butter completely. Add 4 T. of flour. Whisk together forming a basic roux. Cook until bubbly. While whisking, slowly add 2 cups milk until it's smooth and thick. Add 1 cup of cheddar and 1/2 cup of mozzarella cheese and whisk until melted. Then, add salt and pepper to taste. Pour cheese sauce over the slow cooker potatoes and ham. Stir completely. Cook on Low for 6-7 hours, or on High 3-4 hours. 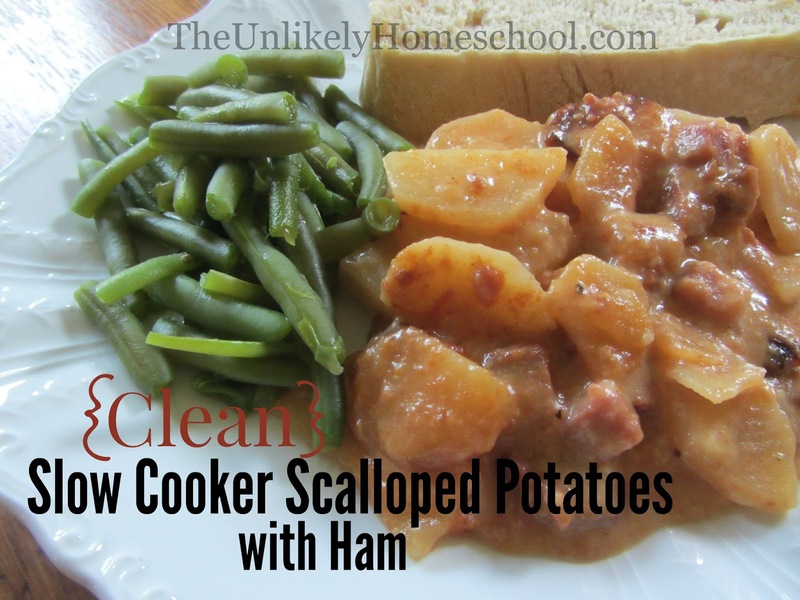 In a large slow cooker, combine sliced potatoes and cubed ham. Sprinkle with minced onions and set aside. In a saute´ pan, melt the butter completely. Add the flour. Whisk together forming a basic roux. Cook until bubbly. While whisking, slowly add the milk until it's smooth and thick. Add the cheese and whisk until melted. Then, add salt and pepper to taste. Pour the cheese sauce over the slow cooker potatoes and ham. Stir completely. Cook on Low for 6-7 hours, or on High 3-4 hours. That looks really good and might just be our dinner. Yes, we tend to stay away from the yucky "cream of MSG" too. Also, watch out for any stock you might buy in a can or carton... I have found only 1, maybe 2 brands without MSG. Very true. I usually make my own stock or buy the organic variety from Costco. Is it ok to use dairy products for 6+ hrs in the crock pot? I've used cream, milk, and cheese for 6+ hours recipes. The only dairy I try to avoid for that length is cream cheese. As long as it doesn't come to a boil, dairy should be fine. Where did you find ham that isn't preserved with sodium nitrite? I have looked everywhere! We shop at Costco. Can you tell me the brand name of sodium nitrite free ham you buy there? I will have to try this recipe. My "picky" kids would eat it. Thanks for sharing. This recipe looks like one my family would enjoy. My daughter has nightshade and gluten allergies, so we make our own 'cream of' soups, since most of them have 'spices' listed, but don't tell which ones. Don't you just love it when they have hidden ingredients? !